Donald Trump holds up an executive order that he signed during a meeting of the National Space Council at the East Room of the White House June 18, 2018, in Washington, DC. 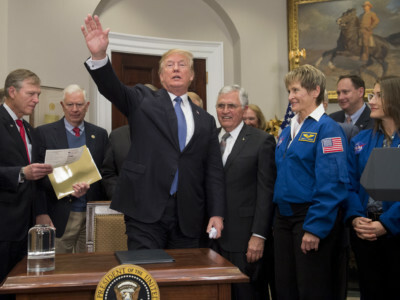 Trump signed an executive order to establish the Space Force, an independent and co-equal military branch, as the sixth branch of the US armed forces. Janine Jackson: While the internet treated it largely as a kind of painful joke, corporate news media reported the Trump White House’s plans to establish a “Space Force” as the sixth branch of the US military as almost an inevitability: A Los Angeles Times story slips from saying the force “would be” responsible for training military personnel to saying the space command “will centralize planning for space war-fighting.” The pushback reported is from those concerned about “bureaucracy,” or changes in the “roles and budgets” of existing military branches. There are details to be worked out — even such “basic” ones, says a Washington Post front-pager, as “what uniforms” the space force would use. But coverage presents potential opposition to the plan, from congressmembers, for example, more as a “hurdle” than a cause for deeper investigation. We can ask how media can report the statement, from the bipartisan leaders of the Armed Services Committee Panel on Strategic Forces, that “beefing up” military capabilities in space “will result in a safer, stronger America,” with no thought to whether terrestrial war-making has made America safer or stronger, but we know that elite media takes place in this sort of la-la land where those presumptions are premises. But I want to ask you about the more specific claim being made, and simply recited in the press, about the nature of this plan: USA Today says it “would develop forces to defend satellites from attack and perform other space-related tasks.” It says the Pentagon’s plan “identifies” — doesn’t allege, but identifies — Russia and China as “explicitly pursuing space war-fighting capabilities to neutralize US space capabilities in a time of conflict.” What are we to make, Karl Grossman, of the idea that creating a space force is a defensive measure? What we would be doing is opening the heavens to war, making space a war zone, and that flies in the face of the Outer Space Treaty of 1967, which sets space aside for peaceful purposes, and precludes the deployment in space, by any nation, of weapons of mass destruction. And there’s been efforts — I’ve covered them for years now; mainstream media has not covered these efforts — to broaden the Outer Space Treaty to preclude not just weapons of mass destruction, but any weaponry in space, and in that way ensure that it would be space for peace. And the two countries that have been leaders in this effort have been Russia and China. In fact, I have here a piece from Chinese media, this was just a couple of weeks ago, “China Envoy Calls for Strengthening Outer Space Covenants and Cooperation.” What Russia and China — and let me mention, too, our neighbor Canada — have been promoting, pushing, has been a treaty titled Prevention of an Arms Race in Outer Space, the PAROS treaty. And I’ve been actually to the United Nations for votes on the PAROS treaty. And one country after another country votes for it — again, with Russia, China and our neighbor Canada in the lead. And the one nation, in all the countries of the world, voting against the PAROS treaty? The United States. And because there’s a consensus process for a disarmament treaty, the PAROS treaty has gotten nowhere. So what we’d be doing by creating this Space Force, and seeking, as Trump put it, “American dominance” in space, is just really asking for Russia and China and other countries — there will be India and Pakistan, the list will go on — to go up into space and weaponize space. So it’s really turned on its head; it’s being presented, in the words, largely, of Mike Pence and other officials, that it’s “our adversaries,” as it’s put, that have already transformed space into a war-fighting domain — those are their words — and so, therefore, the US has to get up there to respond. I must say, China did a real stupid thing in the year 2007. It used one of its missiles to destroy an obsolete Chinese satellite. And the next year, we did the same thing to one of our satellites, with a missile. And this is being used by the US as an example of China being keen on anti-satellite weaponry. In fact, what is was was a very dumb way to eliminate a satellite, because you’re left with all kind of debris — dumb on the Chinese part, and dumb for the United States to do the same thing the year after. But up to now, China and Russia — and I’ve spoken to officials of both countries, and I’ve been to both countries; I’ve been on the story for a long time — and they’re very, very reluctant to violate the intent of the Outer Space Treaty. Also, and they’ve gone on and on with me about this, they don’t want to waste their national treasuries; they don’t want to expend — I mean, to put weaponry up in space is an expensive proposition; it isn’t like acquiring a tank or even a jet fighter; billions and billions of dollars would be the cost — and they’ve told me that they just don’t want to waste their money on placing weapons in space. However, if the US moves up into space with weapons, with this mission to dominate the Earth below from space, despite the cost, they’ll be up there. I’ve read a lot about satellites, Karl, but a word that I haven’t seen much of in this current round of coverage is nuclear. But that’s got to be in the story, right? Absolutely. In moving up into space, with the Space Force, no doubt the United States will be placing nuclear power systems in space. That was the architecture of Reagan’s Star Wars, orbiting battle platforms with nuclear reactors on them providing the power for hypervelocity guns, particle beams and laser weapons; as Star Wars head general James Abrahamson said, without reactors in orbit, there would need to be a long, long extension cord that goes down to the surface of the Earth, bringing up power. Consider the consequences of a shooting war: Battle platforms are hit, and radioactivity from these nuclear reactors rains down on Earth. You really are not getting the picture of, not just things going wrong, but things going as they might be anticipated to go, being, really, a horrific calamity for human beings. It’s a very tidy image that we’re getting about what war in space would be like. This lethal threat would be above our heads. I did a documentary a number of years ago, entitled, advisedly, Nukes in Space: The Nuclearization and Weaponization of the Heavens. And nukes and weapons in space, they go together. And I wanted to ask you about that question of priorities, finally. The Washington Post had an article headlined “Potential Winners if a Space Force Flies,” which delivered the no doubt shocking news that “a group of government contractors sees a chance to profit.” Hold onto your hat! An analyst tells the Post, “Lockheed Martin, Northrop Grumman and Harris Corporation may be particularly well positioned to benefit from Trump’s Space Force.” I found it odd to present military contractors as sort of savvily responding to policy, as opposed to driving it, but then, to your point, there was vanishingly little reference in media coverage to who would not benefit from this allocation of funds, to what would be lost, to what would be harmed, and so I wanted to underscore that point that you made, just to say, media didn’t talk about it either. As to what people can do, we have to rise from the grassroots. An excellent organization, that I would recommend that people connect with, is the Global Network Against Weapons and Nuclear Power in Space. Its website is Space4Peace.org, and among other things, the Global Network will be doing, October 6–13 this year, they’re going to — all over the world, this is going to be happening — protests and other actions in a Space for Peace week. So from the grassroots, people — certainly in this country, and all over the world — need to stand up and to stop this madness, to keep space for peace. We’ve been speaking with Karl Grossman, professor of journalism at State University of New York/College at Old Westbury. You can find his recent article, “Turning Space Into a War Zone,” on CounterPunch. Karl Grossman, thank you so much for joining us this week on CounterSpin. The delays also lessen NASA’s return on investment with the contractors.